You are currently browsing the tag archive for the ‘irene’ tag. 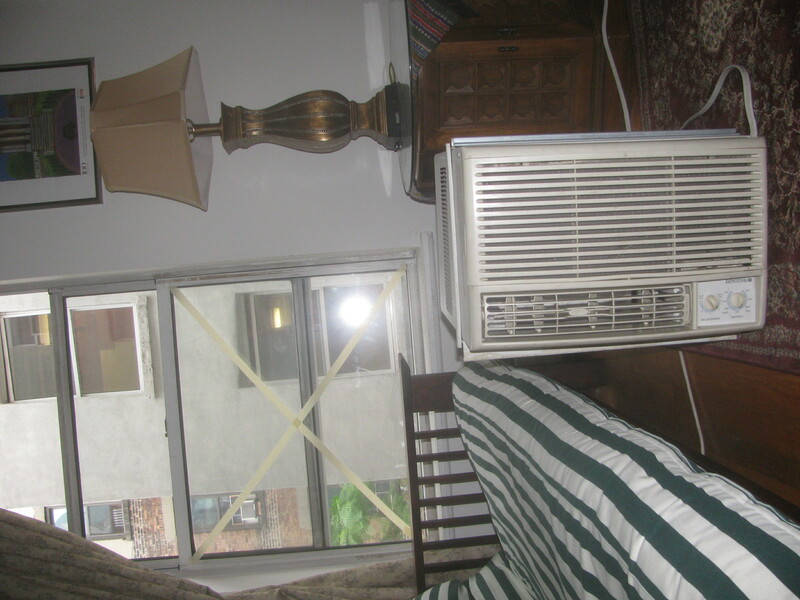 Woke up this morning—on the living-room couch, since that was the farthest I could get from the windows in my one-bedroom apartment—fan still going, to learn Irene had been downgraded. Quickly bored to tears by WNYC’s “reports” of dog-walkers in Williamsburg and the endless reporting that there is really nothing to report. Mostly I’m wondering how Irene feels now that she’s been publicly branded with that big scarlet D across her chest. One of the worsts parts about having to cancel my dinner plans* last night due to impending hurricane was the fact that I no longer had a pressing reason to clean my apartment. So I didn’t. Instead, I somehow managed to spend the entire day, while waiting for the coming on of Irene (sorry), posting on Facebook. 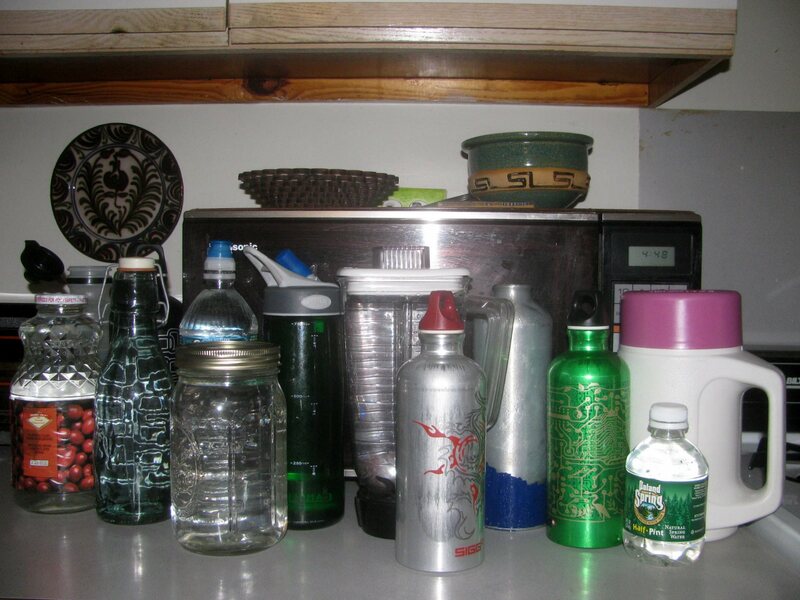 Here, then, is my “Hurricane Preparation” photo series. (I) Excessive supply of water: check. [Yes, that beat-up peeled-off silver/blue one has seen better days. It survived falling out the back of a minivan in one of the dustiest places I’ve ever been (Ratanakiri Province, Cambodia) as well as, of course, volcanic mud. No need to fear! I got my Baby Jesus candle. Actually, I got Baby Jesus AND Our Lady of Altagracia. 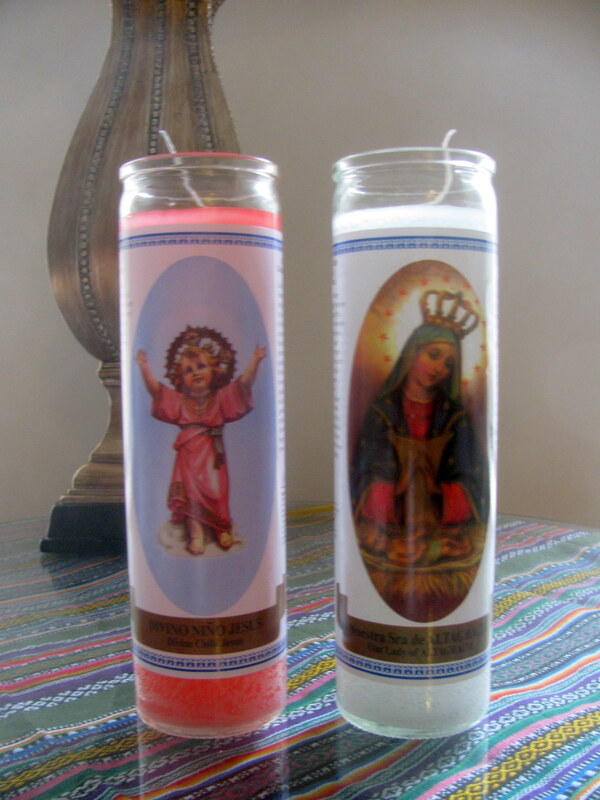 I can’t tell you how happy I was when I found out my local bodega a) had exactly the kind of candles I was looking for and b) HAD ONE WITH BABY JESUS! Also interesting to note, while I was traipsing around in the rain in the late afternoon looking for open stores/bodegas (not many), I noticed that, much to my relief, the Lower East Side bars were as packed as ever. Apparently douchebags don’t break for hurricane prep. (III) A/C out of the window, onto the floor: check. 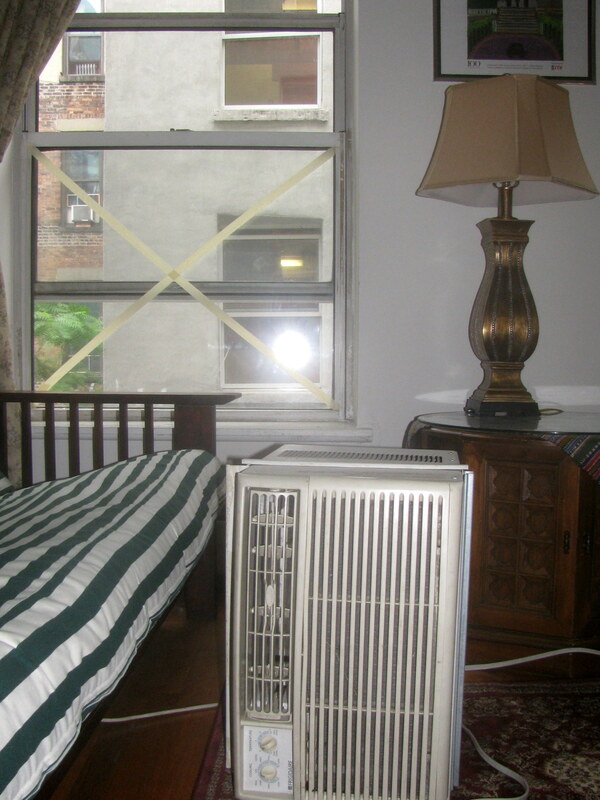 I have no idea why I appeared to be the only one in New York worried about the stability of a god-knows-how-many-pound air conditioner hanging out her apartment window during a hurricane. 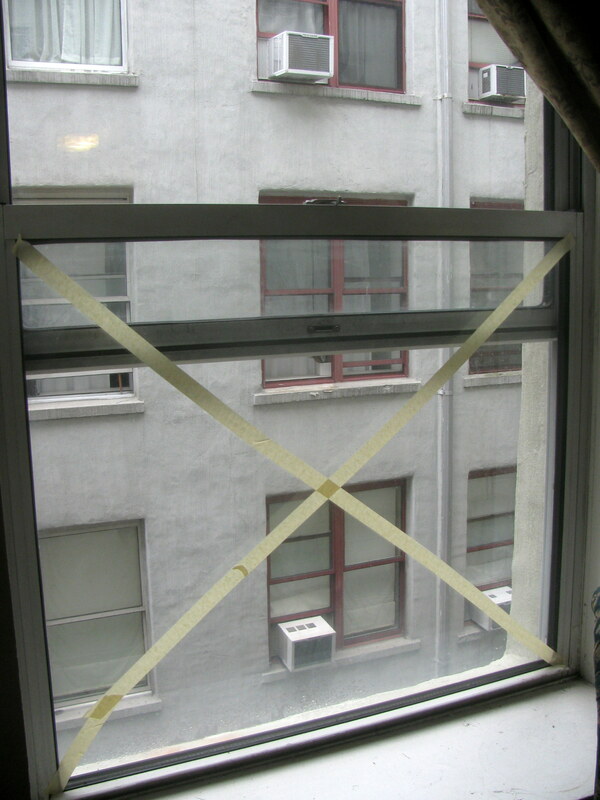 There was much debate on the interwebz as to whether or not to tape Xs on one’s windows. 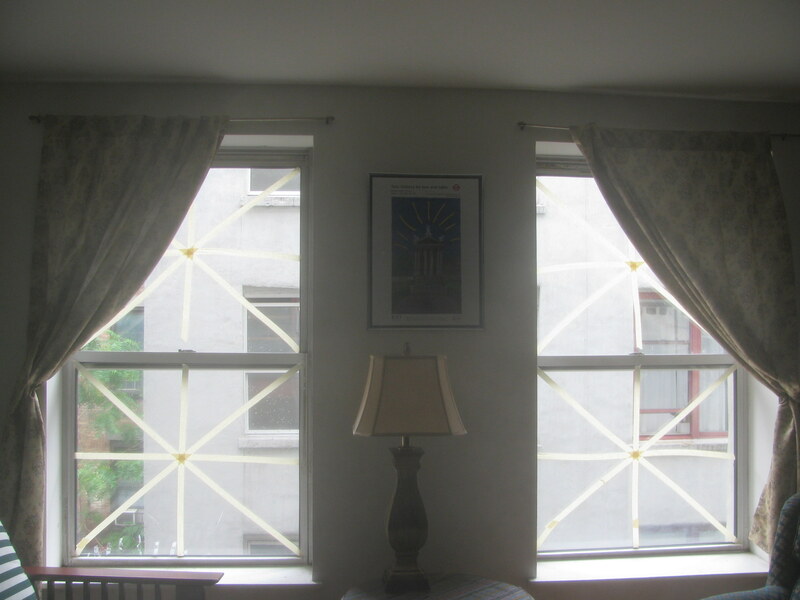 I figured a) it certainly couldn’t hurt, and b) I spent five bucks at an East Village deli on a roll of masking tape slightly wider than the one I already had at home, so you could be damn well sure I was gonna tape my windows. 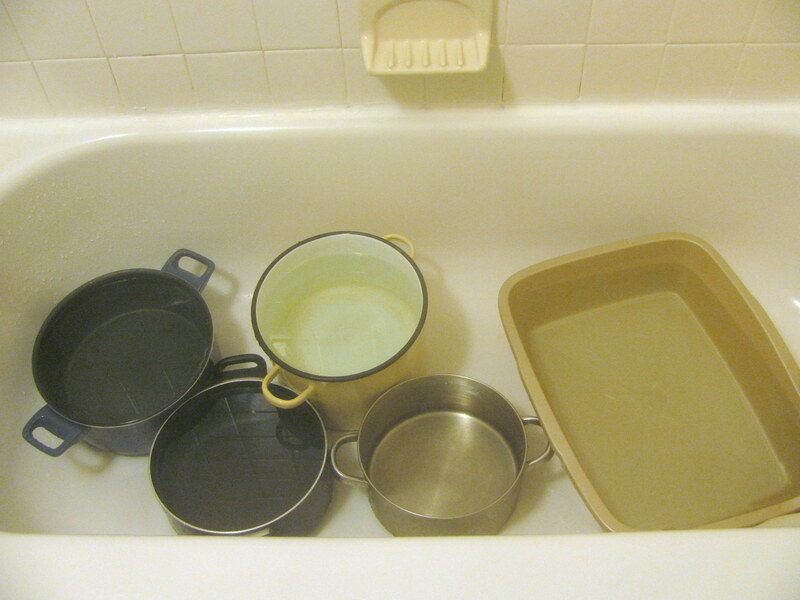 (V) Bathtub full o' water: check. What? Everyone kept telling me to fill the bathtub with water. Seriously, though, I felt like Amelia Bedelia. Note to self: Don’t assume that the rubber tub-stopper thingy you were so sure was in the cabinet under the bathroom sink is actually there. 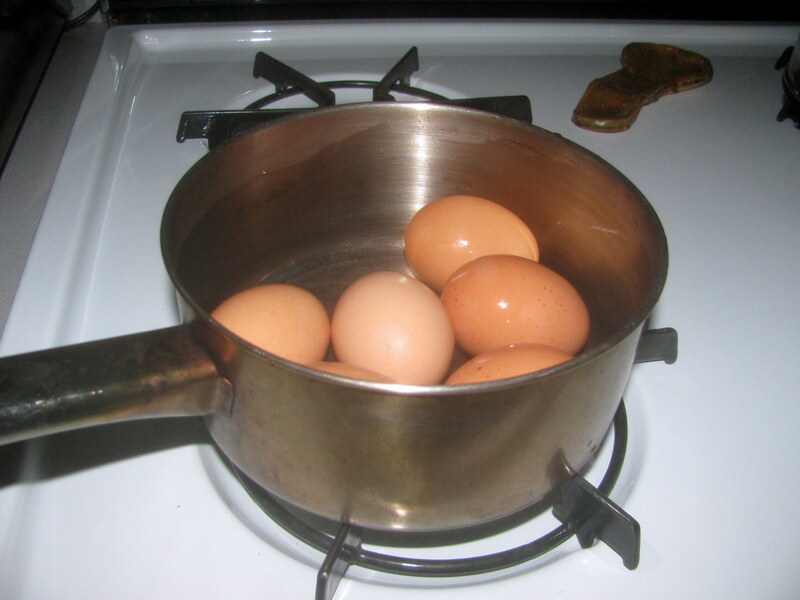 (VI) Excessive hard-boiled egg supply: check. 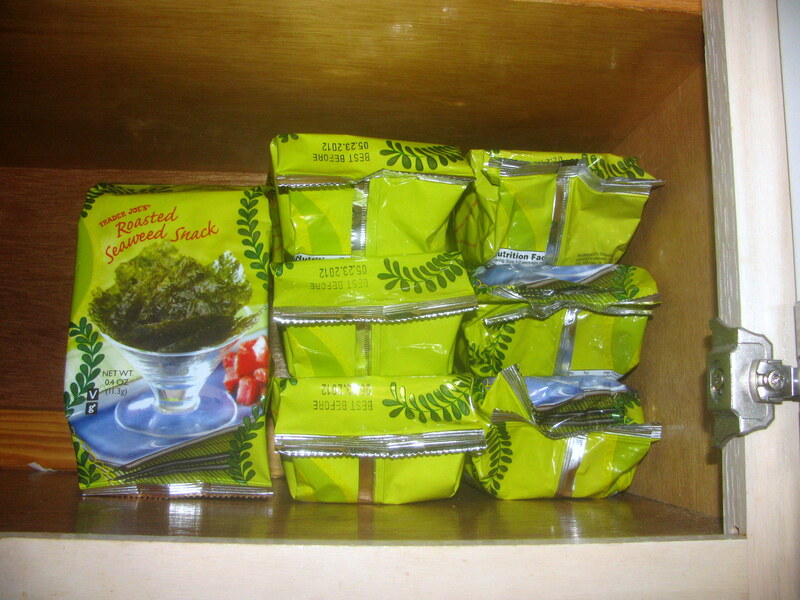 (VII) Closet full o' seaweed: check. OK, these were not actually purchased during my last-minute pre-hurricane foraging (Everyone in this town knows better than to go to Trader Joe’s for last-minute anything.). This is just my ‘normal’ stash. What can I say? I love me some roasted seaweed! 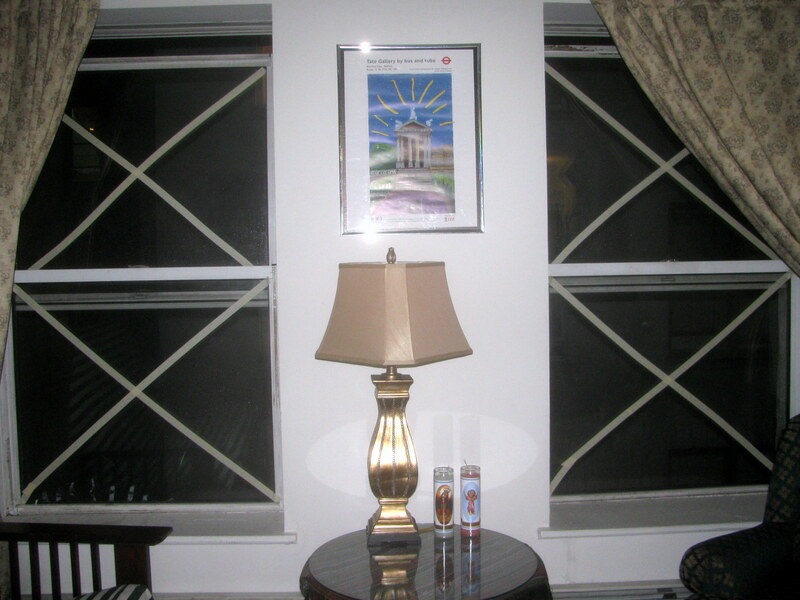 (VIII) Fully masked Confederate-flag-esque windows left very slightly open: check. But then another (non-hurricane-experienced) friend posted a Snopes entry dispelling/dismissing the myth, and I was truly torn. The Morning After: hurricane, schmurricane. Is that the sun I see, little darling? In fact, I resisted reading the entire day because I figured if I didn’t have electricity on Sunday there would be nothing else to do, so I should take advantage of having power while I still did. Of course, instead of watching all those DVDs I’d planned to watch, I did this. I had also assumed that at some point on Sunday I would be “forced” to eat all of the ice cream in my freezer. While I’m glad I didn’t have to have it for breakfast, I will admit to being somewhat disappointed at the moment. *I was supposed to cook dinner for two friends last night, but given the fact that the entire city was going to shut down at noon (or at least my friends’ ability to get to my apartment), we had to postpone. Thus I was left with the dilemma of what to do with the three-pound flank steak in my fridge. I could freeze it and hope for the best (if the power outage was brief but not quite brief enough, being in the freezer would save it from spoiling as it would in the refrigerator). I could put it in the slow cooker as planned and have a large emergency supply of Korean BBQ (well, “BBQ”) beef to get me through the hurricane. But if I lost power, it would quickly spoil and go to waste. Thankfully, my friend Vanessa came up with the perfect solution: Cook the beef and freeze most of it overnight. That way I have food to eat for dinner and a better chance of being able to eat it later as leftovers.